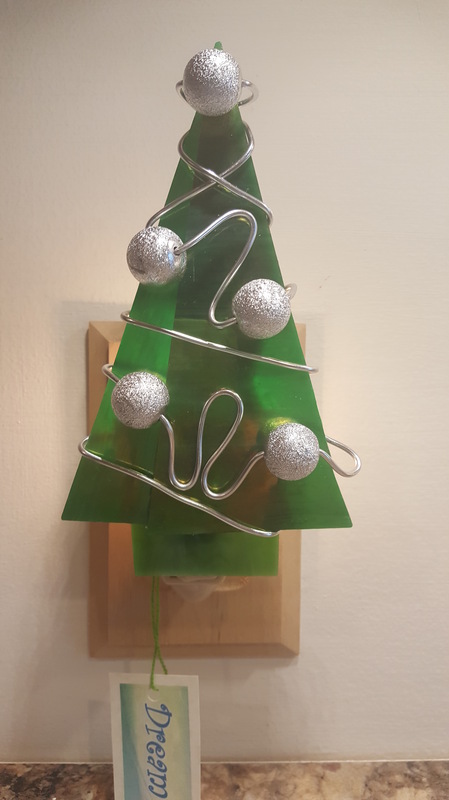 Dream Lights – a perfect gift for every season and reason …. 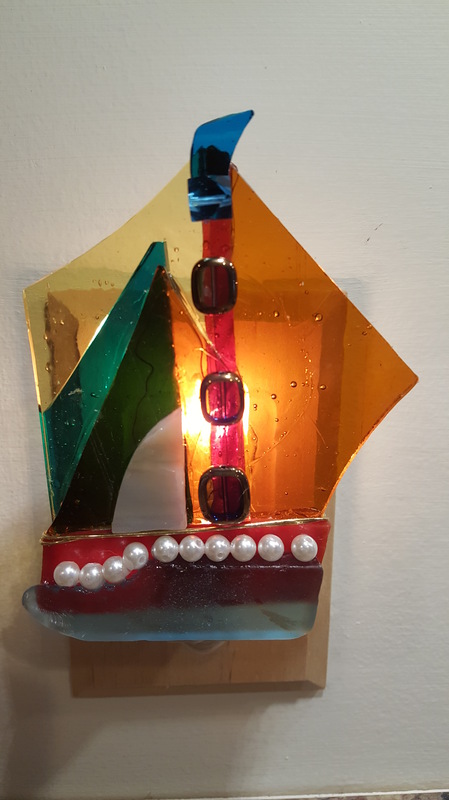 Creating stained glass night lights began as a simple creative trial and error project. First, I made one for myself. Then, I made one for a friend. Next, I made some for relatives. Their feedback was positive and they encouraged me to find an outlet for my lights – a place to sell them. 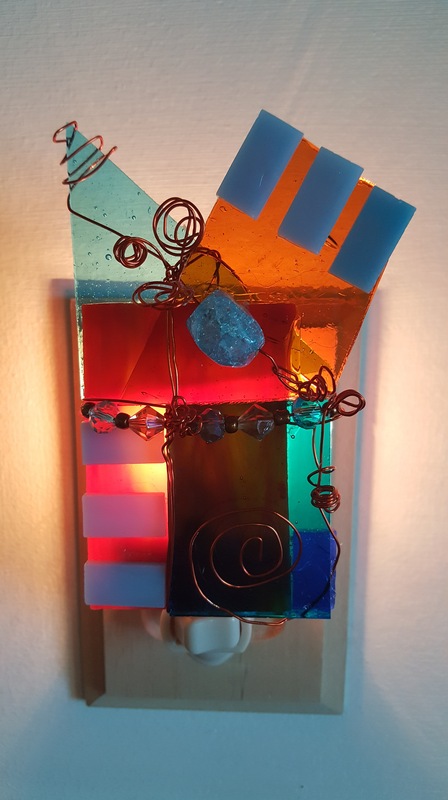 Having served for numerous years on the board of the Watermark Art Center, I decided to ask the Executive Director if she might be interested in selling my lights in the Watermark Shop. We’d share the price. She was interested, so I created a few samples to show her. She loved them. My husband built an electric display to showcase nine lights. 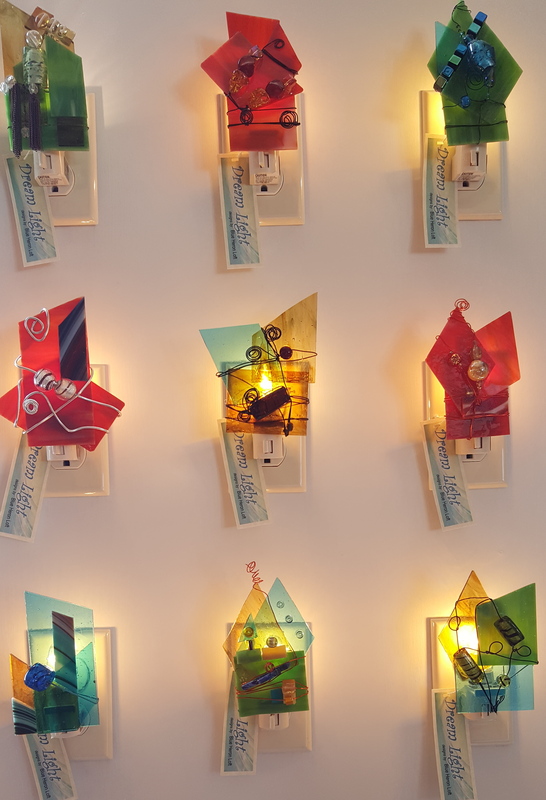 With one flip of a switch in the back of the display, all nine lights come to life in their various sizes and shapes. They add a nice glow to a corner of the Shop in Watermark. To come up with a name for my lights, I emailed a few possible options to friends and family and asked for their feedback. Based on their in put, I landed on Dream Light. I created a sales tag, business cards and a sign to be mounted on the display. From Vista prints, I ordered business cards and a metal sign. I print my tags in-house. From Amazon, I ordered a supply of white paper bags with rope handles and colorful tissue paper to wrap each light in, once purchased by a Watermark customer. It was July, 2018, when my husband transported the display to Watermark Art Center. I had created a dozen lights to start with, not knowing if anyone would be interested in buying one. 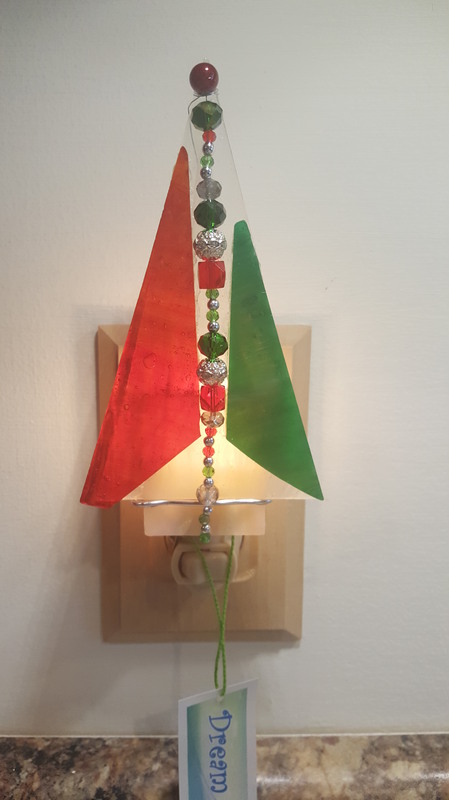 By the end of December, 2018, 70 plus lights had sold for $25.00 each. Watermark took a 40% cut and I was paid 60%. Watermark handled all the sales, including sales tax. All I have to do now is keep making Dream Lights. 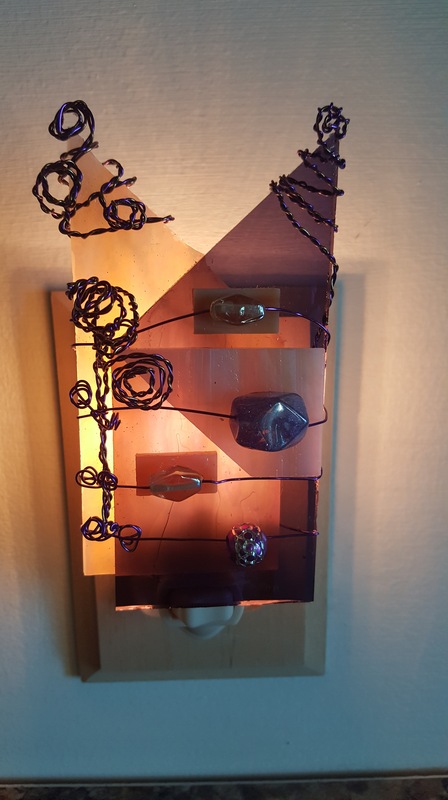 If you are interested in purchasing a Dream Light, visit the Shop at Watermark Art Center in Bemidji MN, the first city on the Mississippi River. Every light is uniquely original. No two lights are the same. 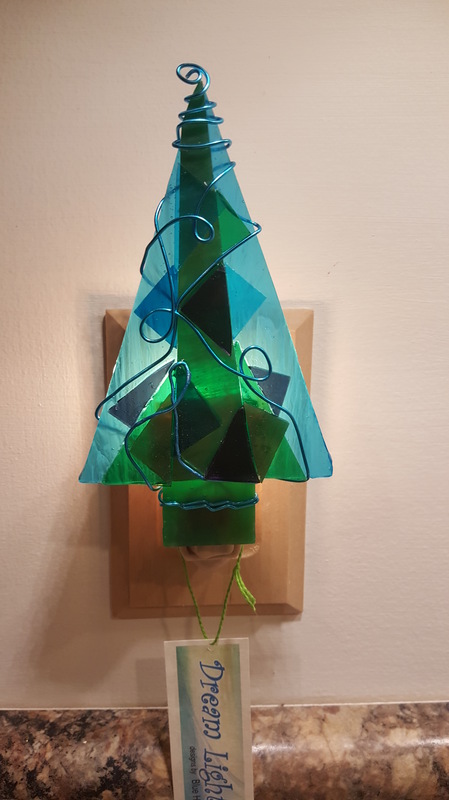 Over the holidays, I created numerous tree-shaped lights. They were a hit. The price of each light is now $30. Watermark Art Center profits by the sale of these lights. We are now splitting the $30. We each take 50%. My take pays for my glass, beads and glue. Each light takes about two hours to complete so this is not a money-maker – just something fun to create and a way to help Watermark. 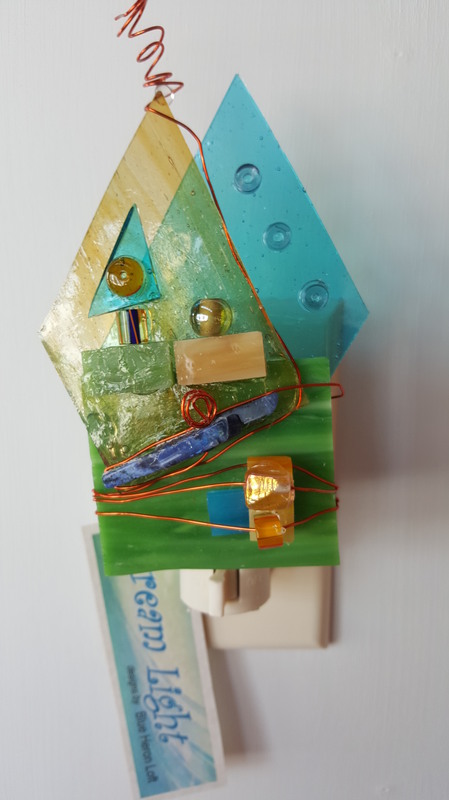 Every dollar helps when you are running a non-profit art center. Watermark is truly a state of the art Art Center and a must see when you are in Bemidji MN. 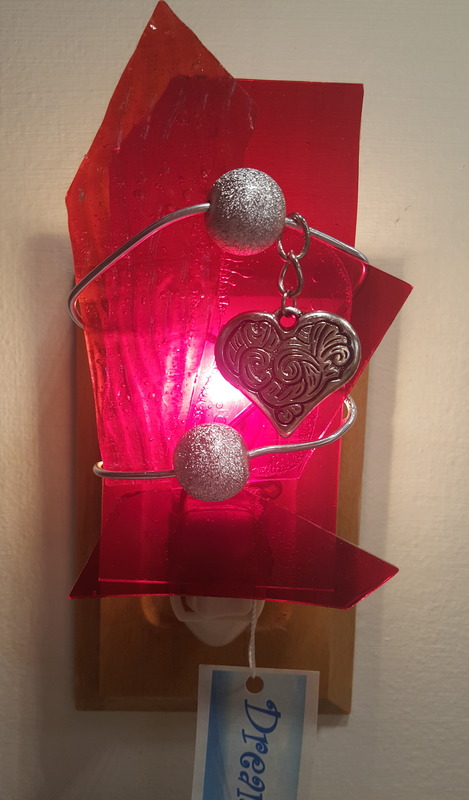 Over the past week, I have been creating ‘love lights’ in preparation for Valentines Day. I have to admit this spontaneous endeavor has been fun, but also a challenge. Surprisingly, I have only had to wear a bandage once due to a minor slip while cutting glass. Learning glass cutting, polishing and finding a glue that would hold tight took time and patience, but I think I have the technique down. I have made nearly 100 lights since July so one would think I should have perfected the process by now. Craft suppliers on Amazon must love me. I order the light fixtures online, but purchase the glass locally. The beads and wire I’ve purchased both locally and online. U-Tube is an amazing source of information for just about any craft project. Check it out.